Area rugs can impart color and warmth to your decor, soften tile and ceramic flooring, add style and charm to a space, and protect your hardwood floors from scratches and moisture damage. But just like other household furnishings, area rugs need proper care to stay looking great. In particular, a rug should be routinely cleaned. 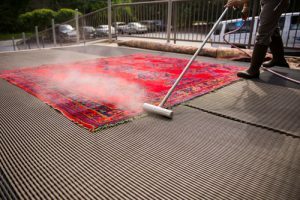 For some people, that may be a matter of rolling up the rug and taking it to an off-site rug cleaner for a professional cleaning. Others may opt to do the job themselves. If you find yourself in the latter category, you may have a lot of questions—especially if you’ve got a very wide, heavy or expensive area rug, or if you’ve never cleaned a large rug before. Still, you may be fine tackling the job yourself, if you use the right cleaners, tools and techniques. But you do need to know what you’re getting into, before you start soaking your rug with detergent. To help you better understand what needs to be done and what’s involved, we’ve jotted down some of the questions we’re frequently asked about how to clean area rugs, along with our answers. This will help you decide whether or not you’re up for the job, and if you do take on the project, ensure that you do it correctly. The answer to this question varies, depending on where the rug is placed, how much traffic it gets, what materials the rug is made of, whether pets live in the household and how many there are, and how well the rug is maintained (vacuumed, spot-treated, etc.). In general, most area rugs need a thorough cleaning every 12 to 18 months. If the rug is in a high-use area such as the family room or kitchen, it may need a more frequent cleaning schedule of every 6 to 8 months. In addition to thorough cleanings, area rugs should be regularly vacuumed. Vacuuming helps reduce the accumulation of dust and dirt inside the rug’s fibers, and keeps the rug looking nicer in between cleanings. On average, vacuuming rugs once a week is ideal. How can I tell if my area rug needs to be cleaned? You may not be able to determine if a rug is dirty just by casually glancing at it. What usually happens is as a rug begins collecting dirt, it will gradually start looking duller. That’s not something most people will be tuned into. To judge how dirty a rug is, pick up a corner of the rug and whack it with your hand. If a cloud of dust flies out of the pile, the rug needs to be cleaned. You can also take a look at the warp and weft (the base of the pile at the foundation of the rug). If you see dirt deep inside the pile, the rug needs to be cleaned, as a vacuum cleaner can’t reach that deep. Are there certain types of area rugs that should only be cleaned professionally? Your average, run-of-the-mill area rug can often be cleaned as a DIY project at home. 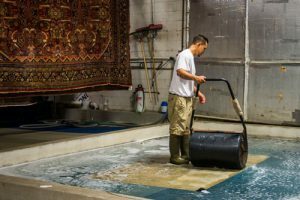 But if you’ve got Persian or Oriental rugs (which are generally made of silk or wool), or any other rug with a “dry clean only” label, it’s best to take them to a professional rug cleaner. These kind of rugs are pricey, and you don’t want to risk damaging them with a less-than-perfect DIY cleaning job. That said, you may be okay spot-cleaning them for stains, but first, pretest the cleaning agent in an inconspicuous area on the rug. What type of cleaning solutions are safe to use on area rugs? 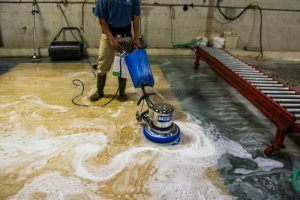 Your best bet is professional-grade rug cleaning product, especially if you’re cleaning an expensive rug that you’re concerned about ruining. But if that’s not an issue, you may be okay using a homemade cleaning solution. Many people like to use a solution of mild liquid dish soap or detergent and warm water (don’t use hot water as it could fade the rug’s colors or cause shrinkage). Avoid using store-bought carpet shampoos on your area rugs. These products have been known to cause rug bleeds and discolor the dyes in rugs. If your rug is made of wool or a wool blend, do not use a laundry detergent-based cleaning solution on it; detergent can leave a residue and alter color shades. If your rug has a high plush pile, use a liquid cleaning agent, as powder cleansers often leave a residue in fibers. Before cleaning the entire rug, test your cleaning agent on a small part of the rug that is not very visible. Some cleansers can ruin the texture of the rug or cause the colors to fade, and pre-testing can prevent damage to an entire rug. What are the main steps involved in cleaning an area rug? First, thoroughly vacuum the rug on both its front and back sides to remove surface debris. Next, take the rug outdoors and place it on a flat, waterproof surface (such as your patio or driveway). Test your cleaning solution in a small, inconspicuous area of the rug to make sure it’s colorfast. If the colors don’t bleed, you can then apply the cleaning solution to the entire rug. Use a sponge or soft-bristled cleaning brush to work the solution into the rug’s fibers. Let the solution remain on the rug for several minutes. Then use your garden hose to rinse off the rug. Be sure to rinse thoroughly, so no soap residue remains. Once rinsed, wring the rug as much as possible to remove excess water. Next, hang the rug to dry. Depending on your weather, you could let your rug dry outdoors by setting it on a clothes-drying rack, slatted picnic table or breezeway. Or, take the rug to your basement, laundry room or garage and lay it on a worktable or counter, with drop cloths or towels underneath to protect the floor. Do not hang a wet rug over a single clothesline, as this can distort the shape of the rug. Most rugs will need 1 to 2 days to dry (the higher the humidity, the longer it’ll take). Once the rug is completely dry, vacuum it again before putting it back in its place. Keep in mind this a project best done sometime between spring and early fall, as the cleaning and much of the drying is outdoors. Also realize this is a job for two or more people, as a wet area rug may be far too heavy and bulky for one person to handle. Is there a “right” and “wrong” way to vacuum an area rug? When you vacuum, go slowly (this allows the vacuum to do its best work) and vacuum from side to side, rather than end-to-end (so the fringe is not sucked up into the beater bar). Never vacuum against the rug’s nap (doing so presses debris back into the rug) or on the rug’s fringes (this could break and tear the fringes). If you have a shag rug, don’t vacuum the back side, as this could pull out the fibers and damage the rug. What type of vacuum cleaner is best to use on area rugs? In general, handheld, wet/dry, canister and upright vacuums with upholstery attachments are best. But no matter which type of vacuum you use, you will need to adjust the settings, based on the type of rug you’re vacuuming. For instance, a rug with a thick pile (such as an Oriental rug) should be vacuumed at the highest setting. A rug with a thin pile (such as an indoor-outdoor rug) will need the height lowered. Setting the vacuum to the correct height will optimize its performance. Can smaller area rugs be cleaned in the washing machine? Yes. Unless the rug has a tag stating it should be dry cleaned, small rugs (such as throw rugs, braided or woven rugs, and others made of cotton or synthetic fibers) can often be washed in the washing machine. Wash the rug on a gentle cycle with cold water, without adding other items to the wash. Dry the rug by hanging it inside a shower, or attach one end of the rug to a clothesline using clothespins. Don’t use the dryer to dry the rug (this could damage the rug’s fibers and cause it to lose its shape). What is the best way to remove stains from an area rug? If possible, address the spills while they’re wet. Use a clean, absorbent cloth or white paper towel to blot up as much liquid as you can. Start at the outer edge of the spill and work toward the center to prevent the liquid from spreading. Try not to rub, as this could set the stain deeper into the rug, making it harder to remove. To remove a stain that has already dried and set, blot the stained area with a clean, white towel that has been dipped into a solution of liquid dish soap, white vinegar, and warm water. Start at the outside of the stain, working inward, and keep blotting until there is no more transfer of stain onto the towel. Use a clean cloth dipped in water to rinse out the soap. Blot the area with a dry towel to dry. My mom used to take area rugs outdoors, hang them on a clothesline, and “beat” them with a baseball bat to get them clean. Is this a good idea? No. If you do this, it can loosen a rug’s woven threads and damage the backing. If the rug is poorly made, it may only take one beating for its threads to separate and the rug to fall apart. Unless you’re “beating” an inexpensive doormat, it’s probably not worth taking this kind of risk. I’ve heard that after a new rug has been washed, it gets dirty more quickly. Is this true? This really depends on what cleaning product you use and how well you rinse after you are done cleaning. Some lower quality carpet shampoos can leave a sticky chemical residue inside the carpet fibers, which is not easily rinsed out and can actually attract dirt and grime. As a result, within a very short amount of time, the rug can become soiled again. The way to prevent this problem is to use a mild liquid detergent (rather than a carpet shampoo from the grocery store), which will easily rinse out and not leave a chemical residue. Enlisting the services of a professional rug cleaner can also solve the problem. Here at S&S Rug Cleaners, we have the tools and the very best carpet cleaning solutions available, to ensure the job is done right—with no chemical residues left behind in the rug fibers. Are there risks in cleaning an area rug yourself, rather than have a professional do it? Yes, if you’re not careful, you can end up damaging your rug. You might accidentally rub, brush or scrub too hard on a stain or spill, which can lead to permanent deformities like fiber distortion or “blooming” of the face fiber. Using highly alkaline cleaning products can cause color loss, color bleeding from one color to the next, or delaminating of the rug’s backing material. Some spot cleaners leave a residue that not only attract dirt, but can also weaken the fabric’s dyes and lead to future color loss. These are just some of the risks. Of course, if you’re washing an inexpensive throw rug, it may not be any big deal to take some risks in cleaning it. But if you’ve got a designer silk rug, it’s best to not take any chances. Let a professional clean it. While some people opt to clean their area rugs themselves, the truth is, most people do not have the time, energy or inclination to do so. If that describes you and you live in the Atlanta area, don’t despair. S&S Rug Cleaners is happy to assist you. 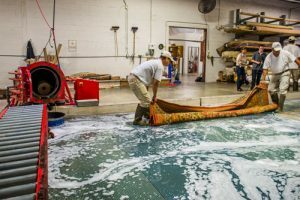 We offer a state-of-the-art area rug cleaning process for all of your fine area rugs. In addition, if your rug needs binding, serging, fringing or other repairs, we can take care of that too. We offer complimentary rug pick-up and delivery, and are happy to provide an in-home evaluation of your rugs as well. If you have additional questions about rug cleaning or what services we offer, or if you would like to schedule an in-home evaluation, please contact us either by phone at 404-355-2126, via email at rugcleaners@bellsouth.net, or by filling out our online contact form. We look forward to hearing from you! Content by Hughes Media for SEO.